1894-95 B.E. 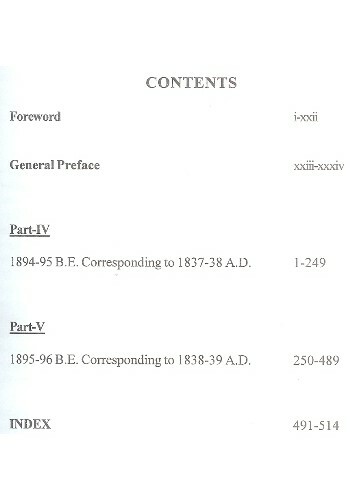 Corresponding to 1837 - 38 A.D.
1895-96 B.E. Corresponding to 1838-39 A.D.
Umdat-ut-Tawarikh in five volume is an important historical document on life and times of Maharaja Ranjit Singh, his ancestors and successors. Chronicled by Sohan Lal Suri it covers the period of history of Punjab from the foundation of Sikh Panth by Guru Nanak Dev Ji in 1469 to 1849 the year of annexation of the Punjab into the British Empire. University has already published the Punjabi translations of Daftar II, III and V. It is gratifying that we are now publishing the English translations of Daftar II, III, IV and V. Daftar II and III cover the most eventful period of the reign of Maharaja Ranjit Singh. This, by far, was the most glorious period of the history of the Punjab. Daftar IV and V cover the period of gradual decline of the Kingdom of Lahore leading eventually to its annexation into the British empire. These works are a part of the multi-dimensional research work being pursued by Maharaja Ranjit Singh Chair and the Department of History of the University. 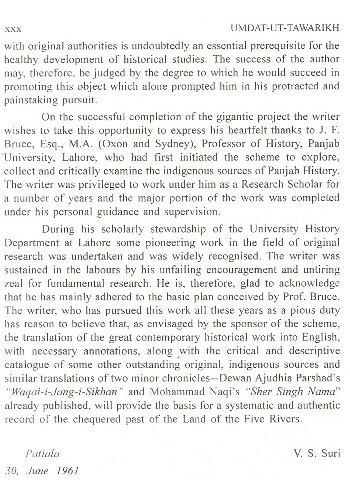 I hope that these publications shall fulfil the requirements of non-Punjabi and non-Persian knowing researchers and teachers of history of Punjab. Sohan Lal Suri, the author of Umdat-ut-Tawarikh was first diarist and then a chronicler of the reign of Ranjit Singh and his successors. From 1771, his father Ganpat Rai had recorded the events connected with Sardar Charhat Singh, his son Mahan Singh and his grandson Ranjit Singh. Sohan Lal started his record in 1812 and continued to keep it till the annexation of the Punjab in 1849. 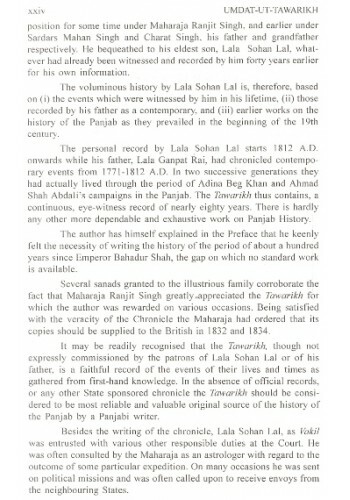 Being closely associated with the court of the Maharaja as a Vakil Lala Sohan Lal's chronicle of Lahore Darbar is typical illustration of the traditional method of recording events. As a Vakil at the court he had the advantage to chronicle the events as an eye-witness at the metropolis. He could verify the records from the notable personages of the period and also had direct access to official reports and records. His chronicle , therefore, is considered as an authoritative, comprehensive and coherent among all the extant indigenous sources of history of the early nineteenth century Punjab. Though the chronicle covers the period from the foundation of the Sikh religion to the annexation of the Punjab by the British yet the author himself was a witness to the period from 1812 to 1849. Sohan Lal Suri's services as a Vakil were well appreciated by the Maharaja. His services were requisitioned from time to time for political and diplomatic missions also. After annexation of the Punjab his services to the history of the Punjab were acknowledged by the British administrators who gave him a revenue free grant worth 1000 rupees a year for his life. But he did not live long to enjoy this munificence. He died in 1852. Sohan Lal Suri's son Mul Chand and his grandson Harbhagwan cherished his memory. They were encouraged by the new rulers of the Punjab to take interest in his work. With their efforts, in the 1880s they got his work lithographed with a subsidy from the Panjab University College of Lahore of which G.W. Leitner was the Registrar. 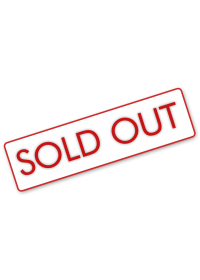 Only 500 copies were lithographed. By now the Umdat-ut-Tawarikh is a rarity. The voluminous work by Lala Sohan Lal (the chronicle) consists of five daftars or volumes. The first daftar covers the period from Guru Nanak to 1771, the year of Ahmad Shah Abdali's last invasion. By this time Sardar Charhat Singh had come into power. The second daftar deals with the career of Sardar Charhat Singh , ascendency of Ranjit Singh, expansion and consolidation of the kingdom of Lahore with its well defined boundaries covering the period upto 1830. At this time the glory of the kingdom and grandeur of the court of Lahore was at its zenith. The third daftar in five parts, is the narrative of events from 1831 to the death of Ranjit Singh in 1839. The fourth daftar in three parts, covers the period from 1839 to 1845. These were the most unfortunate years in the history of the Punjab. The successors of Maharaja Ranjit Singh and the courtiers engaged themselves in incessant intrignes at the court. The political stability of the court reached at its lowest ebb and exposed to grave danger from the formidable neighbours on the eastern and western sides. The last daftar with the last phase of the kingdom of Lahore from 1845 to 1849 when the deterioration in managing affairs of the state was leading it towards annexation. The first daftar had 172 pages, the second 408 pages, the third 764 and the fourth 218 and the fifth has 175 pages. 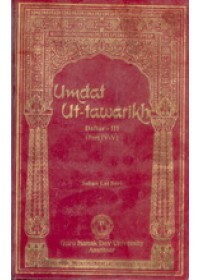 The whole account of Umdat-ut-Tawarikh thus contains over 1700 pages. The entire Umdat has been translated from Persian into English by late Shri Vidya Sagar Suri, the great grandson of Sohan Lal Suri. He did this work as a Research Assistant in the History Department , Panjab University , Lahore in 1939. 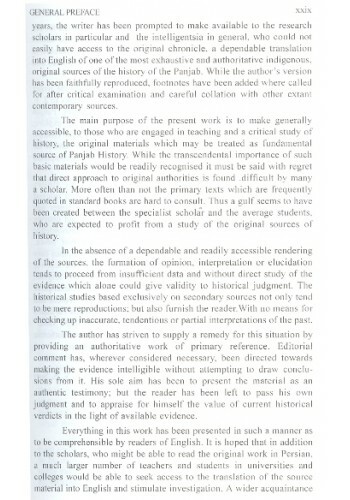 The work was intended to be published by the Panjab University , Lahore but owing to the prevailing uncertainty its publication had perforce to be deferred. Shri V.S. Suri, however, with the deep commitment and sincerity managed to bring alongwith other valuables of his household, the type-script of the translation during the exchange of population between India and Pakistan. Due to financial constraints all the daftars could not be published. He could get daftar III published by S. Chand and Company in 1961 and himself published daftar IV in 1971. The family of Shri Suri kept the translations of other three daftars in their careful custody. The opportunity to publish the order daftar came when Maharaja Rajnit Singh Chair was established in the Department of History, Guru Nanak Dev University, Amritsar in 2001. It was through the initiative of Professor Indu Banga that Shrimati Neeru Suri, the daughter-in-law of Late Shri V.S. 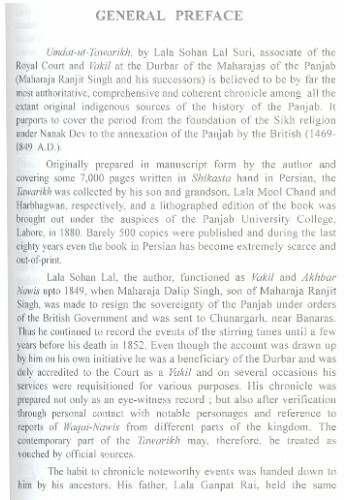 Suri contacted the chairperson of Maharaja Ranjit Singh Chair for the publication of these volumes. Dr. S.P. Singh, the Vice-Chancellor with his enlightened interest and magnanimity took no time in agreeing to take up this work in the right earnest. The University is now publishing the English translation by Shri V.S. Suri, of daftar II and V of Umdat-ut-Tawarikh for the first time and the reprint of daftars III and IV. For sheer preservance and working patiently for years on these translations, Shri Suri has earned the gratitude of all those who are interested in the history of Punjab during this period. It is for the reader to judge the quality of this translation. We feel that the translation is as accurate as possible though at places dedicatory passages, rhetorical and poetical quotations prefixed to various chapters or sections have been omitted by the translator. The material thus deleted has, however, been indicated at appropriate places. We on our part have followed the text provided to us rather literally. All the foreign words in Persian, Hindi and Punjabi which had to be retained as technical and administrative terms, have been given in italics. The objective behind the publication of these volumes is to make it accessible to all those who are engaged in teaching and a critical study of history and are much interested in the original and fundamental source of the history of Punjab. Our sole purpose has been to present the material as an authentic testimony and it has been left to the reader to pass his own judgement. Dr. Harish C. Sharma and Dr. S.S. Sohal have seen daftar II through Dr. Sukhwant Singh has seen daftar V through the press. I am thankful to them. We are thankful to Professor Prithipal Singh Kapur for carefully vetting daftar V, Dr. S.S. Sagar and Dr. S.S. Narang have seen through the press the reprints of daftar III and IV. Ms. Indu Bala has worked with me in preparing the index of daftar II. I am thankful to them all. I am also thankful to Mr. Jagjit Singh Walia, Director , Press and Publications and his colleagues for their diligence and dedication in printing out these volumes. It is hoped that in addition to the scholars, who might to able to read the original work in Persian a much larger number of teachers and students, in universities, research institutes and colleges would be able to take benefit from this translation. Preface To The Book 'The Sikh Empire And Maharaja Ranjeet Singh' PREFACE There are men who ch..
Foreword To The Book 'The Maharajah Duleep Singh And The Government - A Narrative' By Surjit Singh J..